Growing up in the Lockyer Valley near Toowoomba QLD, Roland worked his way from his parent’s fruit shop to a 17yr management career. His heart for people and an interest in aviation meant partnering with MAF was a natural fit for his calling to mission work. 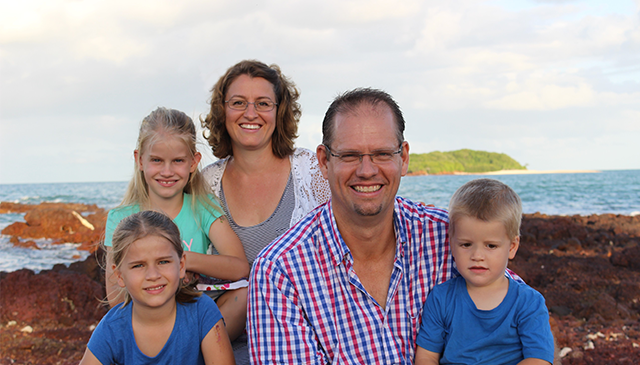 Sarah grew up in rural Vic whilst also spending 8 years in PNG where her family were missionaries. Sarah has worked alongside young people, families, people with disabilities and those from culturally diverse backgrounds to create and deliver a range of services. Roland and Sarah share a passion for the principles of social justice and a heart for disadvantaged peoples and their communities. Roland & Sarah married in 2006 in Brisbane and moved to Melbourne in 2010. They have been blessed with 3 beautiful children – Marishka 26.2.09, Scarlett 1.9.11 & Rafael 13.1.15. Their relationship with God and His love has fuelled a desire to bring practical and spiritual care to others. Roland & Sarah have a heart for Aboriginal people and other cultures and are partnering with MAF to bring help, hope & healing to places in the world with the deepest human need.